Manohar was born in 1981 in Mumbai. Manohar received his B.F.A. degree (Painting) from Sir J. J. School of Art, Mumbai. He received the Governor of Maharashtra Award and Medal in 2007; he won the K.K. 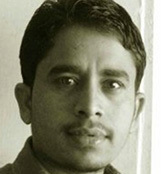 Hebber Art Foundation Award and the Monsoon Show award in 2006; he won the Silver Medal from Sir J. J. School of Art, Mumbai from 2003-2005. He has participated in a group show at Singapore Art Fair organized by Gallery 7, Mumbai in 2007 and 2008; he took part in group shows at Jehangir Art Gallery, Mumbai in 2007 and Nehru Centre Art Gallery, Mumbai in 2005. He participated in several shows: Lalit Kala Akademi, New Delhi in 2002; Art Society of India in 2003-2006; Harmony Show in 2004 and Bombay Art Society Exhibition in 2003-2007. From 2014-2016 he participated in group shows: 'Art for a Cause'; Meher - Art with a Heart'; 'Meher II - Art with a Heart' and 'Painting Dreams, Coloring Lives' at Gallery 7, Kalaghoda in Mumbai. Best watercolor, P. A. Dhond Award from Sir. J. J. School of Art in 2006; best watercolor from Raza Foundation Award, award for best watercoluor from Art Society of India at Jehangir Art Gallery, Mumbai in 2003 and best watercolour award from S.C.Z.C. in Nagpur in 2002. Manohar lives and works in Mumbai.